Legacy Habitat offer the full range of accessories, tools, electric fence testers and other fittings to work with your electric fence system. Any product can be ordered online through www.wildlifefencing.co.uk or you can call us on 0114 261 9478 where we would be happy to discuss your requirements. A number of electric fencing kits are available for small electric fencing animal enclosure systems or for domestic use. These are designed to contain all of the necessary componants for small electric fencing installations and are also expandable with an additional extension set. Electric fencing gates are designed to provide a means of crossing the fence line by vehicle, on foot, or with livestock without having to interupt the power to the fence. Power is maintained by running lead-out cables underground across the gate opening while a spung loaded or retractable line wire provides the opening and closing mechanism. An electrified steel framed gate and a Drive-thru Electrogate are also available options. 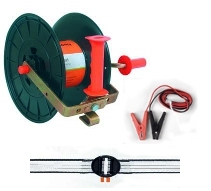 wildlifefencing.co.uk stock a full range of Gallagher connectors, including lead-out cables, tape connectors, wire tensioners, earth connectors, cable reels, ... and much more. 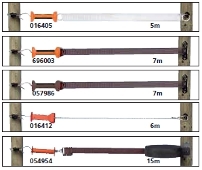 A number of fence testing devices are available so you can ensure that your fence is working correctly and delivering the right power for your needs. The SmartFix tester is designed specifically for use with Gallagher electric fences and can provide a number of performance details from a fence and can even help locate a possible short by indicating in which direction along the fence a fault occurs. 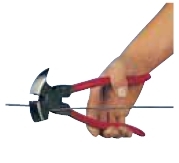 A number of electric fencing tools are available to aid with the installation and maintenance of any electric fence. 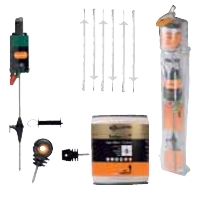 All Gallagher electric fencing tools & accessories are available from www.wildlifefencing.co.uk as well as all other Gallagher electric fencing products.